Multiple stakes winner James First Affair set the fastest time on Saturday from two trials to the $55,000-added Bank of America Emerald Challenge Championship at Emerald Downs. AUBURN, WA�AUGUST 6, 2016�Looking to earn his second trip to the Bank of America Challenge Championship Night, multiple stakes winner James First Affair took the first step on Saturday when he posted the fastest qualifying from two trial races for the Bank of America Emerald Challenge Championship at Emerald Downs. The 10 fastest qualifiers will return to the Pacific Northwest racetrack on Sunday, August 21st to vie for the winner's share of a $55,000-added purse over 440 yards and to earn a starting spot in the October 29th Grade 1 $350,000-Guranteed Bank of America Challenge Championship at Los Alamitos Race Course. Under jockey Nakia Ramirez, James First Affair hoped at the start but dueled Sorelli to win the first of two trials by a head and post the top qualifying mark of :21.926 seconds, a 97 speed index. Mark Hanson conditions the 4-year-old son of multiple stakes sire IVORY JAMES for owners Robin Dunn, Larry Chapple and RTM Stables, LLC. Bred in Oklahoma by Tom Bradbury and Kim Kessinger, James First Affair has compiled a (20) 8-4-1 record and earned $87,822. Out of the First Down Dash mare Fancys First Affair, the brown horse completed in the Adequan Derby Challenge Championship(G3) last year at Lone Star Park. Winner of the John Deere Les Bois Juvenile Challenge at 2 and Bitterroot Derby at 3, he has also qualified to the PCQHRA Breeders' Futurity(G2), Los Alamitos Winter Derby(G1) and Adequan Les Bois Derby Challenge. Hanson also saddled Rtm Mr Caccia, a multiple stakes winning son of All American Futurity(G1) winner NO SECRETS HERE, who defeated Stella Corona by a nose in the second trial to get the fourth fastest time of :22.192 seconds, a 91 speed index. 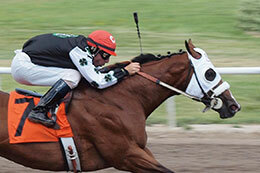 Owned by RTM Stables, LLC and bred in Idaho by Susan Hanson, Rtm Mr Caccia has a (16) 7-3-3 record and has earned $45,264. He is out of the Dashin Is Easy mare Shirleys Secret. For the complete list of Bank of America Emerald Challenge Championship finalists, their times, sires, dams, owners, breeders, trainers and jockeys CLICK HERE.